The D Scene has closed and its final publication was on 29 May 2013. The following is the original letter sent into the editor at the D Scene. The highlighted passage was cut by the sub editor and printed without noting it was abridged. At last week’s DCC Finance Strategy and Development meeting where the last quarter’s financial results were presented, Cr McTavish asked “are we doing things differently?” The DCC net debt chart [attached] shows the past ten years of the same massive debt spending, with future projections hoping for small annual reductions. DCHL’s planned annual funding profit of $23 million turned out to be a $5 million loss, DVL lost $4million, DVML lost $3 million, the Milburn Wood Processing Plant suffered a $3 million write-down, the Chinese Garden continues to lose half a million annually, Toitu Settlers losses will dwarf this, another half million at least has been lost due to the Anzac Avenue site access dispute, the expected $5 million ‘saving’ from Town Hall cut backs has evaporated, the budgeted Carisbrook sale ‘profit’ of $4 million still hasn’t eventuated, and $3 million of unearned dividend has been spent from the Waipori Fund. Standard and Poors threaten an interest-increasing downgrade especially if the Jacks Point/Luggate debacle blows up, and the fuse has already been lit. To answer Cr. MacTavish’s question, we are not yet doing things differently. The direction of this Council remains unsustainable. 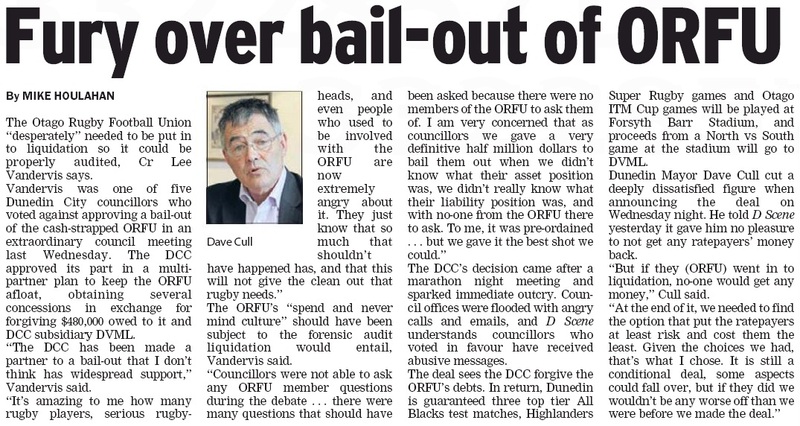 Soothing talk by our Mayor Cull of ‘no drop in service levels’, ‘no slash and burn staff cuts’, ‘no witch hunt’ of directors, ‘no heads will roll’, means that the same heads will continue to inflate Dunedin’s debt disaster. We must do things differently and cut service levels, staff numbers, consultant use, habitual tenders, outside directorships and bring our DCC owned companies governance back in-house where we can know what they are doing. Dunedin lobbyist Bev Butler says the Office of the Auditor-General (OAG) declined to investigate controversial Delta land purchases when she approached it in August 2011. Last Wednesday the OAG announced it would investigate the Delta land purchases after a request from Dunedin Mayor Dave Cull. Butler said she asked for an OAG investigation a year ago, based on issues in Newtons Coachways (1993) Ltd statement of intent and annual reporting, an error in the Dunedin City Holdings Ltd annual report, and Dunedin stadium-related issues. In a response to Butler the following month the OAG declined to look at matters raised by her. 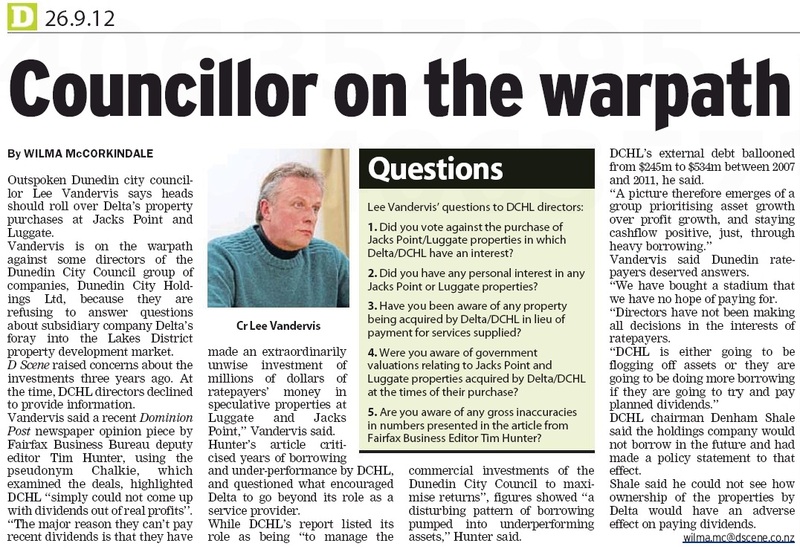 Councillor Lee Vandervis had also conducted research into the Delta deals over the past two years, Butler said. She was concerned Delta was now refusing to answer official requests because of the OAG investigation. Butler had been making Local Government Information and Meeting Act (LGOIMA) requests to Delta chief executive Grady Cameron questioning aspects of the land purchases. Some requests had been met, but last Friday Butler received a response from Delta declining her latest request on the grounds the OAG was investigating. Butler believed the information requested as crucial to establishing what happened in the Jack’s Point/Luggate land deals carried out by Delta in 2008 and 2009. Delta released a statement last week which Cameron says welcomed ‘‘an independent review of the decision-making processes’’. Audit office looking at land deal (see below). Pressure to front about Lakes District property investments has come to bear on Dunedin ratepayer-owned Delta Utility Services Ltd. Wilma Mccorkindale recaps the Delta land grab saga. In 2008 – and again in 2009 – Dunedin City Council-owned company Delta bought land in the Central Otago Lakes District, at Luggate and Jack’s Point. The multi-million dollar investment was controversial. Many questioned why Delta – a Dunedin company whose core business is designing, constructing, and managing and maintaining infrastructure – needed to buy land in Central. Delta chiefs have remained tightlipped on matters related to the purchases since D Scene broke the issue as front page news. Why did Delta get into the property market? What was the catalyst? Who brokered the deals, signed them, and when? What are the projected returns (based on what)? Why did Delta not use the money it spent on the investment returning dividends to ratepayers to offset hiking rates? All declined to respond, although Hudson stood by the purchases, saying they were tabled at the council. He did not see them as high risk. D Scene is still to get the answers to those questions. In 2008 a Delta subsidiary, Newtons Coachways (1993) Ltd – renamed Delta in 2011 – acquired a 50 per cent interest in a joint venture for residential property development at Luggate, spending $5.3 million in 2008. In 2009, Newtons acquires 9.4ha of land at Jack’s Point at $8.82m, for the same purpose. 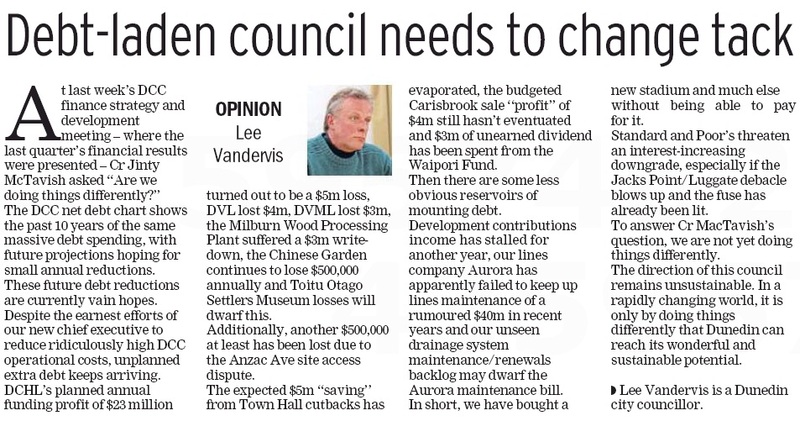 In September this year, through D Scene, Dunedin councillor Lee Vandervis posed more questions about the investments to DCHL directors. The response – to his dismay – was minimal, prompting him to call for the Audit Office to investigate. Last month Delta released its financial statements, which revealed it had reduced the value of the Jack’s Point/Luggate land by $7.5m, because there had been less demand for the residential sections than expected. New DCHL chairman Denham Shale said when Delta’s board decided to buy the land, ‘‘it was thought by them to be beneficial’’. Announcing DCHL was writing down the value of that land, he said: ‘‘That writedown is predicated on the basis of value if a sale of those properties was forced to be made at this time. ‘‘No actual loss has yet occurred, and will not, until the properties have actually been sold’’. Around the same time, Dunedin mayor Dave Cull and chief executive Paul Orders contacted the office of the Auditor-General, which last week decided to launch an inquiry. Cull welcomed news of the inquiry. ‘‘The decision to conduct an independent investigation is a necessary step,’’ he said. ‘‘Council companies operate within a framework of public sector accountability. It is essential therefore, that decisions made by council companies are able to withstand the rigorous public scrutiny that the AuditorGeneral represents,’’ he said. No comment is a familiar refrain where this deal is concerned. Can this stadium make money . . .
. . . Or better to close facility? DUNEDIN City Council is about to unwrap its pre-christmas sack of submissions on how it can make beleaguered Forsyth Barr Stadium work. found the battle lines remain drawn between those for and against the stadium. WILMA MCCORKINDALE reports. Malcolm Farry he believed. It needed to dream up some big new unique events to draw others in the city. However, the city’s high student population could, at times, become a big audience. Sprey also advocated more city council funding to fund or subsidise attracting events like Auckland, Wellington and Christchurch councils did. Dunedin councillor Lee Vandervis said historically, regional stadiums world-wide failed to achieve direct or indirect net financial returns. Claims the stadium would deliver – in spite of its first-year multimillion-dollar losses – were deluded, he said. ‘‘This first year had all the advantages of the World Cup, Elton John, a closed Town Hall and Glenroy, an internationally experienced stadium manager and the novelty effect.’’ Also saying the venue would not work was fellow stadium opponent Rob Hamlin. ‘‘It was stupid idea then and I think it’s a stupid idea now.’’ Representatives from the stadium’s owner Dunedin Venues Ltd and Dunedin Venues Management Ltd declined an invitation to comment. Dunedin city councillor Lee Vandervis is refusing to relent on criticism of Dunedin City Holdings Ltd (DCHL) performance as it announces a lacklustre annual return. 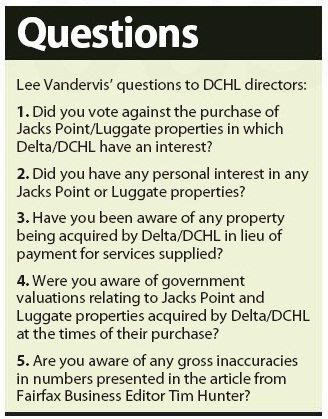 Vandervis has been on the warpath over the Dunedin City Council group of companies, demanding directors answer questions about subsidiary company Delta’s foray into property development at Queenstown’s Jack’s Point and at Luggate. Vandervis said just one shared response, from DCHL chief executive Bevan Dodds, and Dunedin City Council financial chief Athol Stephens, had been received. The pair denied any involvement in the investments, including any prior knowledge of the plan to invest. The DCHL figure showing an annual loss of more than $5 million has steeled Vandervis’ resolve to out those responsible for what he believed were unwise investments. ‘‘Of all the individuals who I expected to have had decision-making input, [M Coburn, N Evans, R Liddell, R Polson, S McLauchlan, P Hudson, B Dodds, G Cameron, A Stephens], the only individuals to reply to my questions are those claiming to have had no part in the speculative Jack’s Point/Luggate property purchases that have cost our ratepayers so many millions,’’ he said in a written statement. DCHL identified a reduction in asset value and goodwill for Delta on past business acquisitions, and land at Luggate and Jack’s Point, among influencing factors on its annual results. 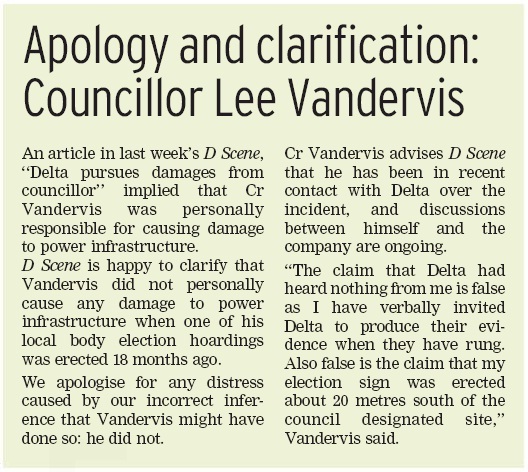 I was very disappointed in your 7/3/12 article ‘Delta pursues damages from Councillor’, because of its judgemental presentation of untruths. The damage done to a power cable by me is only alleged at this point, and did not happen last September as claimed but 18 months ago prior to the last local body election. 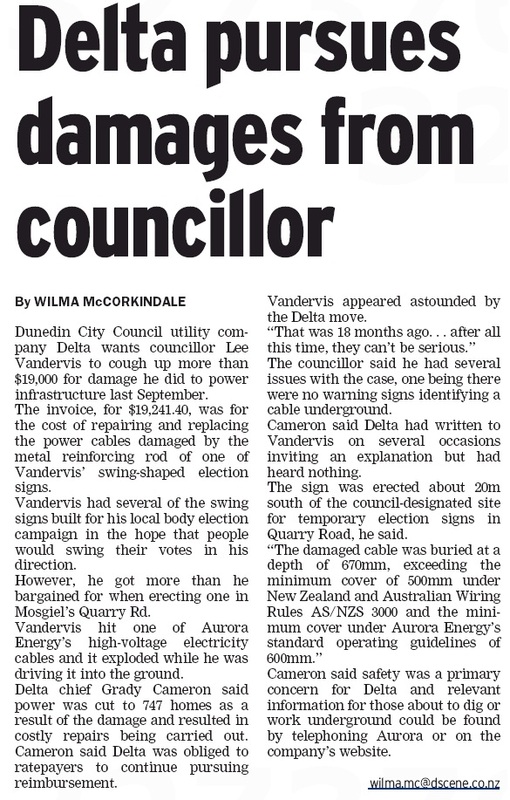 The claims that I personally hit a steel peg that pierced the cable and that it exploded are false, as the more accurate ODT articles on the issue in 2010 made clear. The claim that Delta had heard nothing from me is false as I have verbally invited Delta to produce their evidence when they have rung. Also false is the claim that my election sign was erected about 20 metres south of the Council designated site, as 2010 ODT photographs show. In the interests of accuracy and on-going good relations, I would appreciate you running this letter with similar prominence to the offending article in next week’s Dscene.